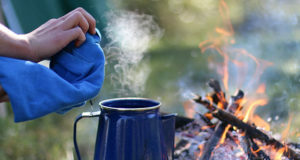 With a Dutch oven, you can learn to cook anything at the campfire you can prepare in your own oven and/or on the stovetop at home. It just takes a little patience, some practice, and the right Dutch oven cooking tools. But when it comes right down to it, Dutch oven cooking is pretty simple. 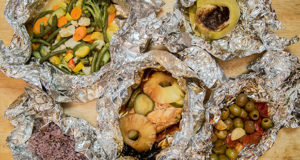 That’s why it was the main cooking utensil for chuck wagons on cattle drives and for families traveling across the American West by covered wagon. 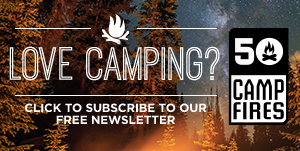 These folks weren’t campers by choice; they were campers – like, DAILY campers – by necessity! You can imagine they would take every shortcut and development to make the most of the technology available to them. Today, we’re blessed with so many modern conveniences that make their way into the campsite to keep us comfortable. Same goes for cooking in Dutch ovens. 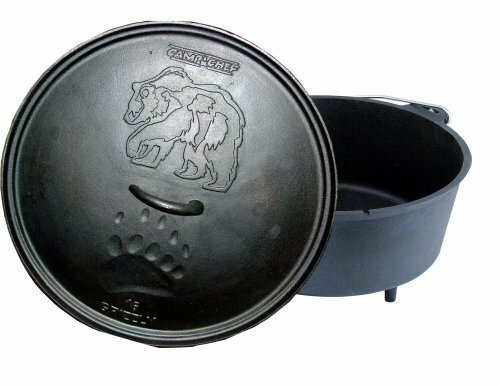 We decided to share our favorite Dutch oven cooking tools that we rely on nearly every time we sling the cast iron. To Dutch oven cook, of course you need a Dutch oven. The first one to buy is a 12-inch, and you might as well get a deluxe model for the added benefits it offers. 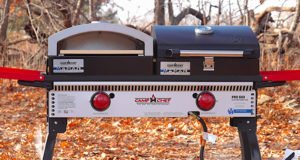 Whether you’re buying a Camp Chef like this one or a Lodge (which are the two most common modern brands you’ll see), look for a pre-seasoned model which will get you cooking that much faster. 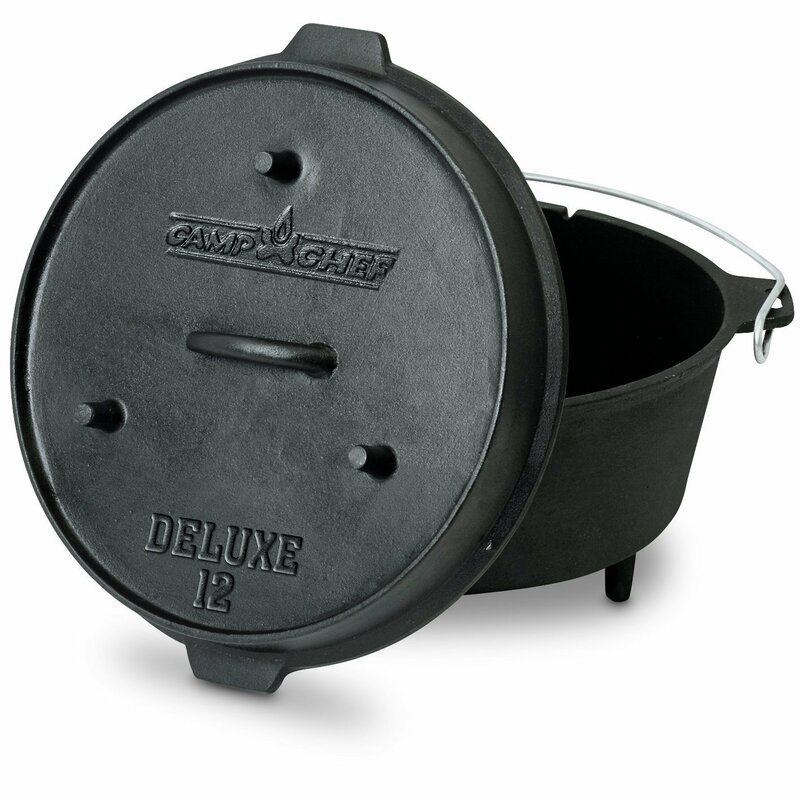 The Camp Chef Deluxe has a deep dish lid that allows for added capacity and air circulation while cooking. 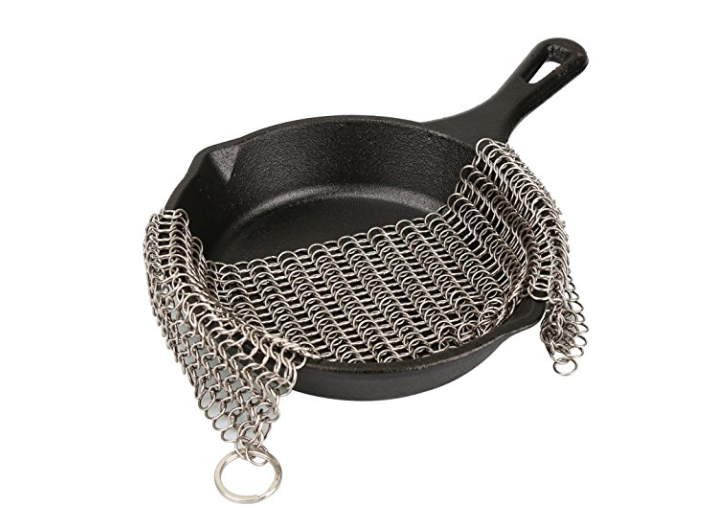 It also inverts on its own legs to serve as a skillet or trivet. Without a doubt, it’s the best way to clean cast iron. Scrape out all you can with a spatula or scraper, then give it a quick rinse with some water. Next, take your chainmail scrubber and polish it clean. 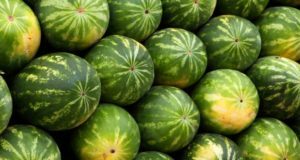 Slosh it again with water, wipe it dry with a paper towel, and then wipe it with an extremely light coating of vegetable oil inside and out. Done. These scrapers are the other half of the cast iron Dutch oven care duo. 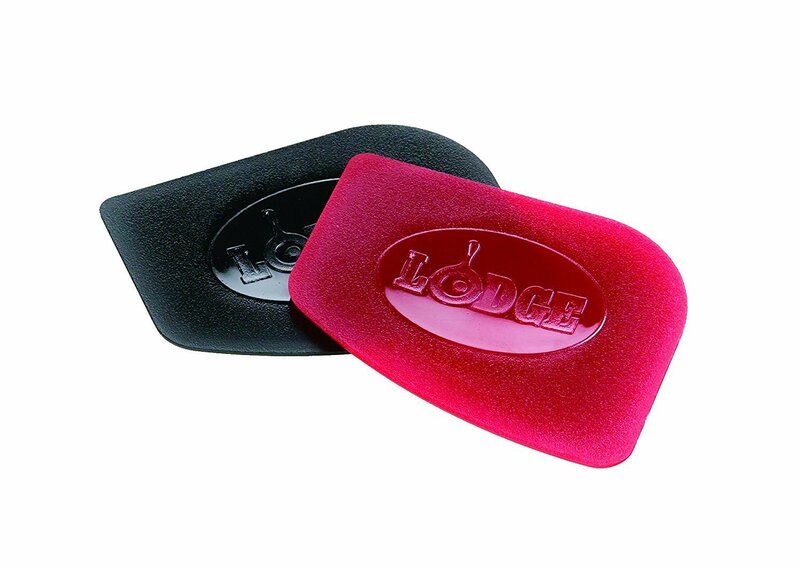 Made from polycarbonate, they are durable and have four different shaped corners for cleaning any shape of pan. Sure, it’s just a hot pad, but it’s also one of the most important Dutch oven cooking tools you’ll own. 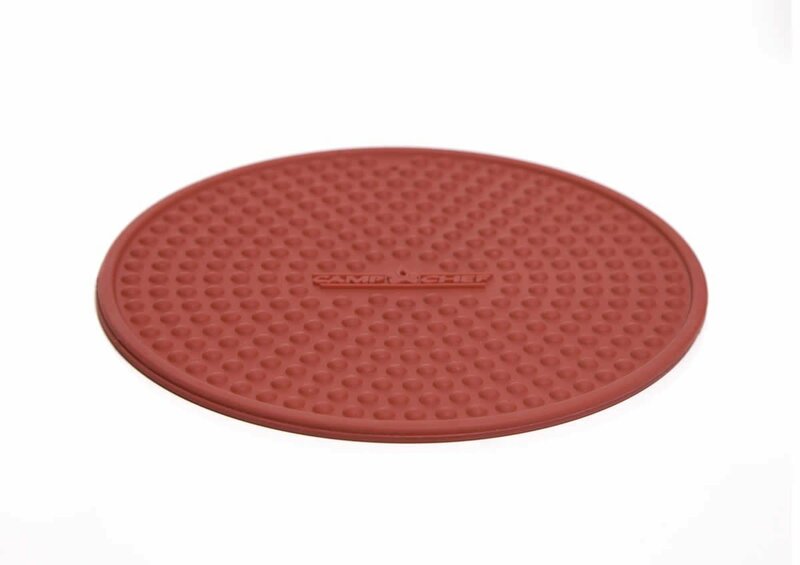 Super versatile, it serves as a hot pad and as to grab hot handles and more. 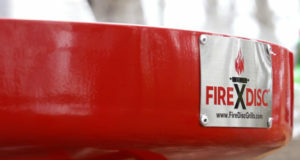 These are heat resistant up to 500F. 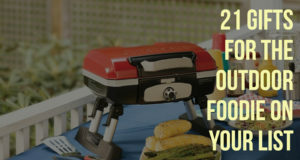 While they are non-stick and dishwasher safe for easy clean up, they are grippy on wood and countertop surfaces; so, they stay where you put them. They are great for opening jars, too. 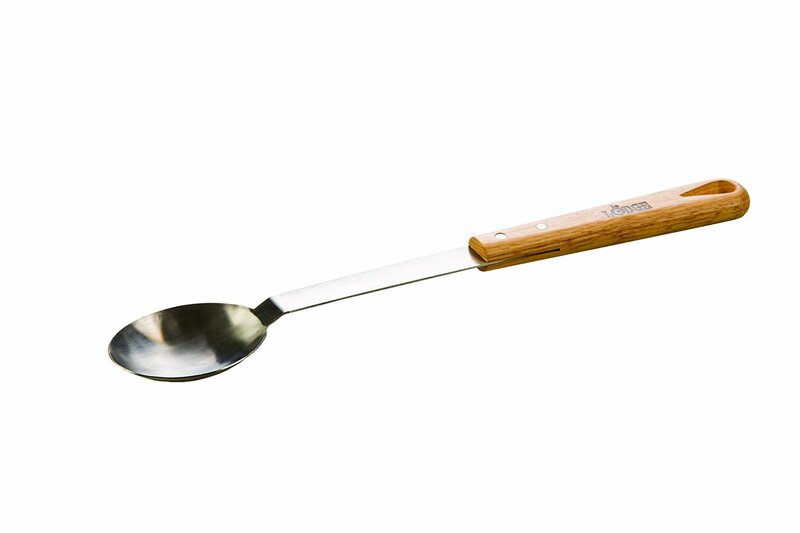 Especially when you make soup, stew, or chili in your Dutch oven, you’ll need a long handled spoon. This is one of the best we’ve found. 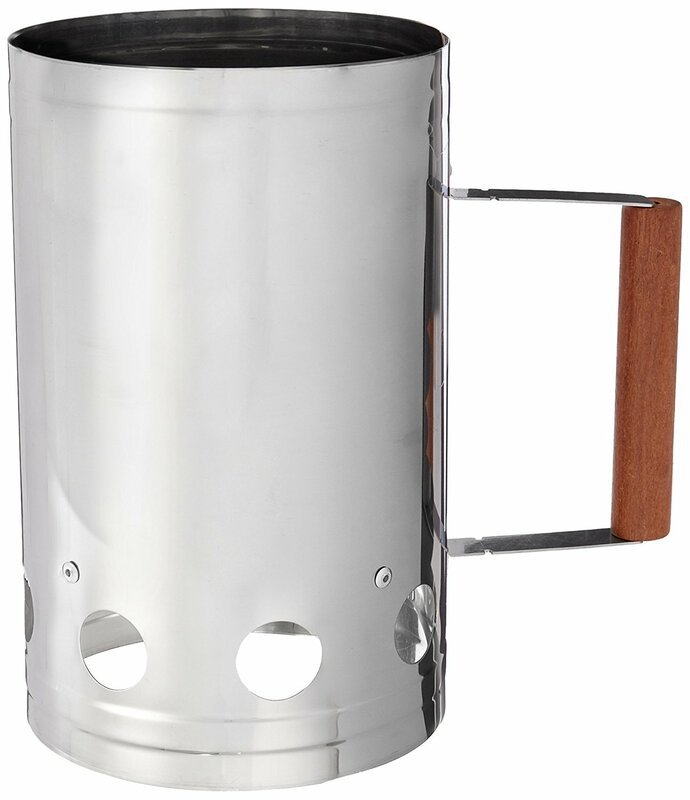 The working end is stainless steel, the hand-filling handle is wood with stainless rivets for attachment. Overall, it’s 18 inches long and comes with a leather lanyard for hanging. 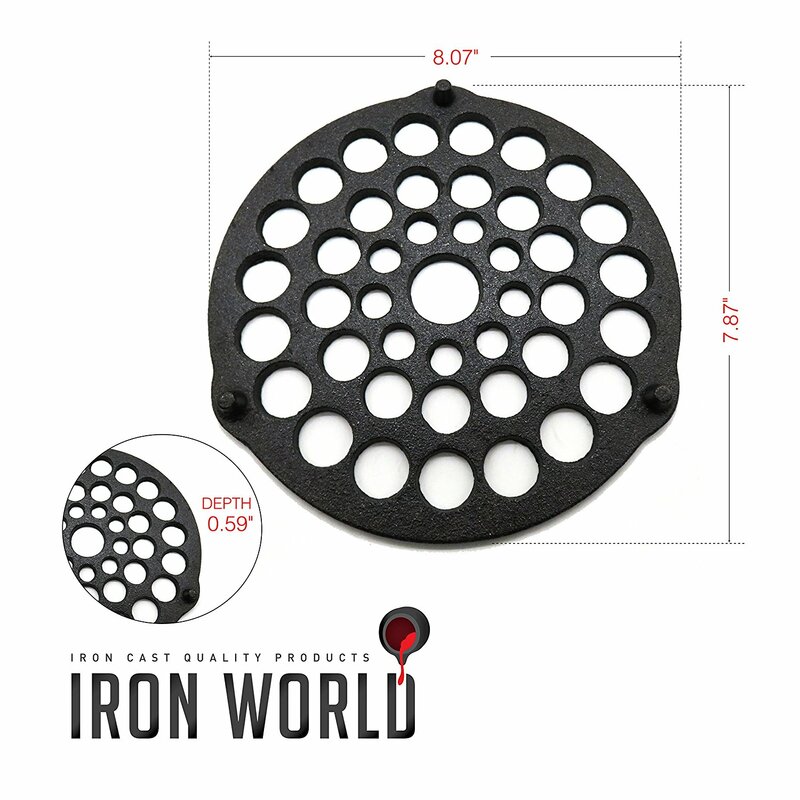 If you said, “that just looks like a metal plate with lots of holes in it” you’d be right, but it’s one of the handiest Dutch oven accessories you can have. It fits in the bottom of the Dutch oven to keep meat out of the grease at the bottom for proper roasting (remember, you can do anything in your Dutch oven you can do in your oven at home), and with a few carefully chosen stones to support it an inch or so off the bottom of the pan, it serves as a rack to make the best steam-baked potatoes you’ve ever tasted. If you want everything you need to care for your Dutch oven over years of service in one package, this is it. 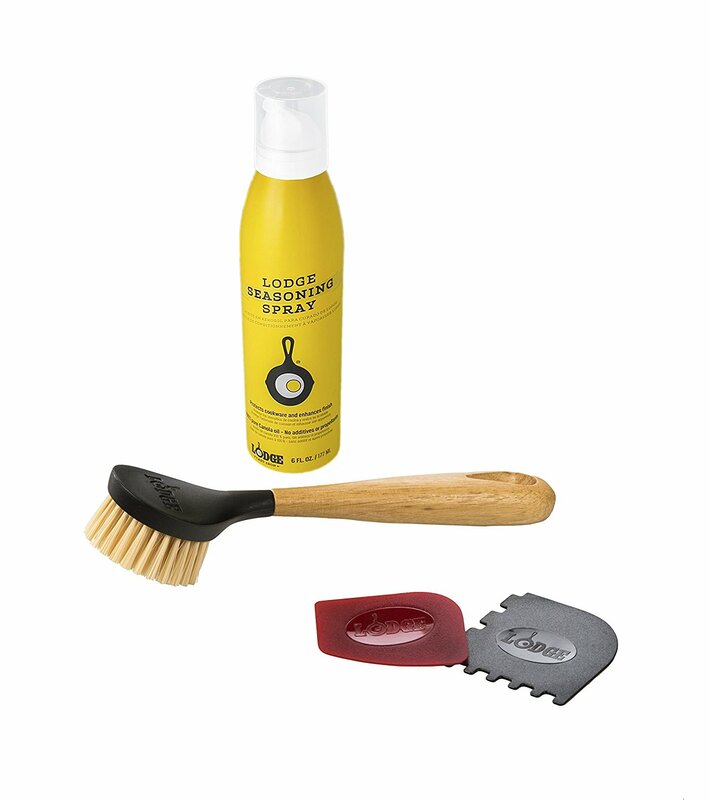 The Lodge Manufacturing kit includes: scrapers, stiff-bristled scrubber brush, and Lodge seasoning spray of 100% canola oil. 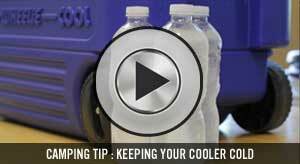 The spray application is especially helpful in laying down a light coating of oil which is what you want. 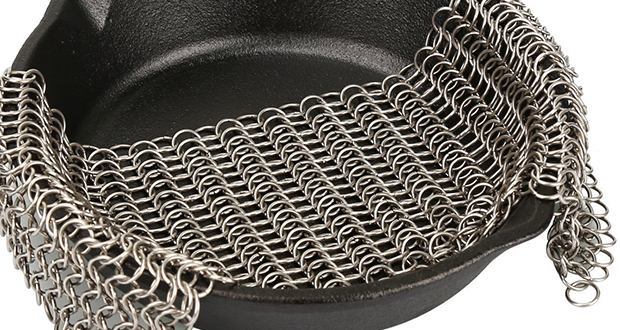 Just add that chainmail scrubber, and this is all the cleaning gear you’ll need. 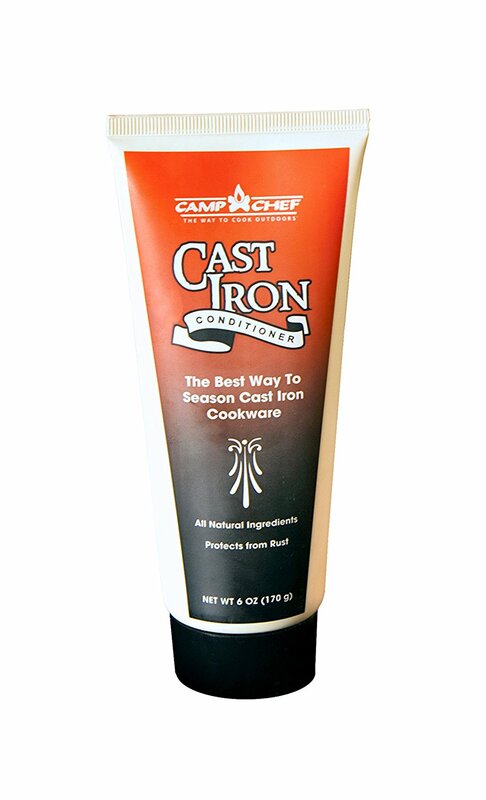 Camp Chef’s Cast Iron Conditioner is a proprietary formula that includes natural preservatives to ensure the oil coating on your cast iron won’t go rancid during prolonged storage. Apply a light coating to ensure your cookware stays seasoned and is always ready to cook when you are. 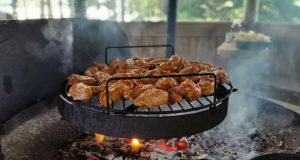 The most precise way to control the temperature in your Dutch ovens is with charcoal briquettes. It’s down to a science these days. A set amount of gray briquettes top and bottom will provide a steady temperature for nearly an hour. 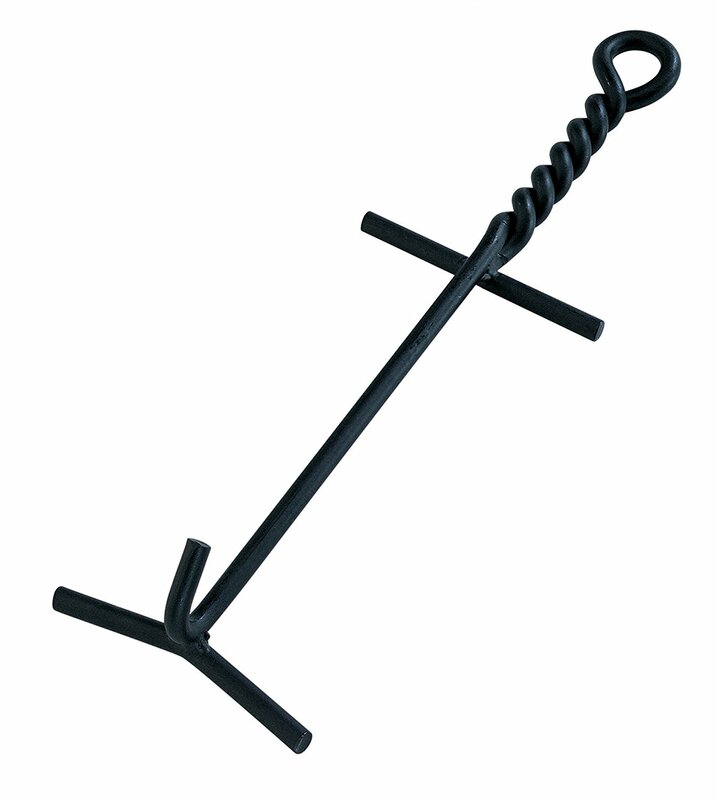 A BIG charcoal chimney like this one is the perfect reservoir for more coals as you need to add them. Stainless steel construction assures longevity. If you’re really going to get into Dutch oven cooking, eventually you’ll want a steel table. It’s the perfect place to use several Dutch ovens at once. 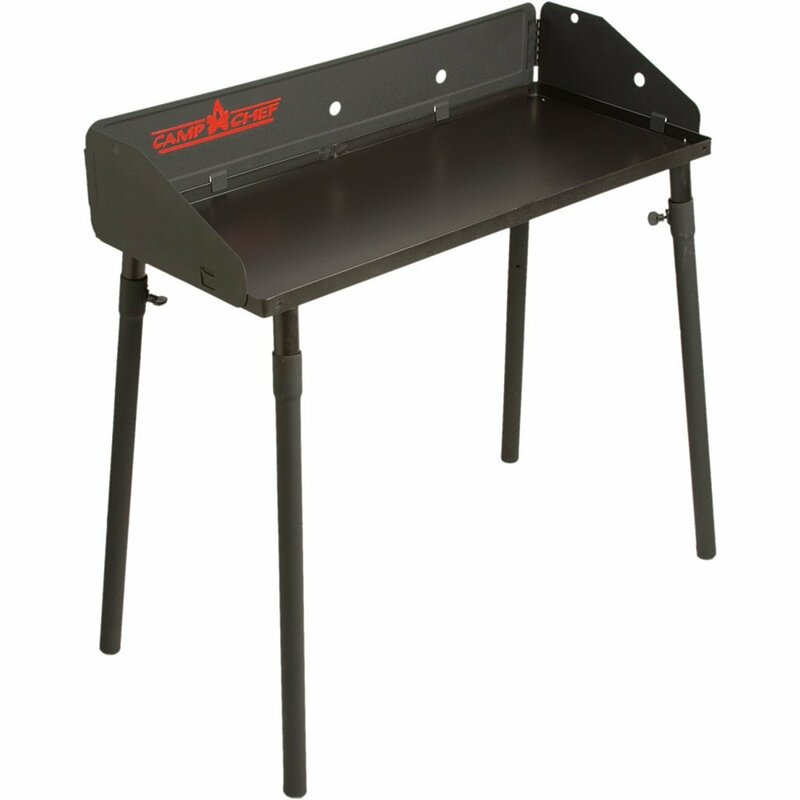 The 3-sided windscreen helps maintain efficient heating and maximizes what you get out of your coals. When your done, simply let the coals burn out completely and sweep them off the table. Once you use a lid lifter, you’ll wonder how you ever cooked without one! It’s not just a hook. It allows you to conveniently ease the lid up and peak at the contents of the oven without completely removing the lid and letting all that heat escape. 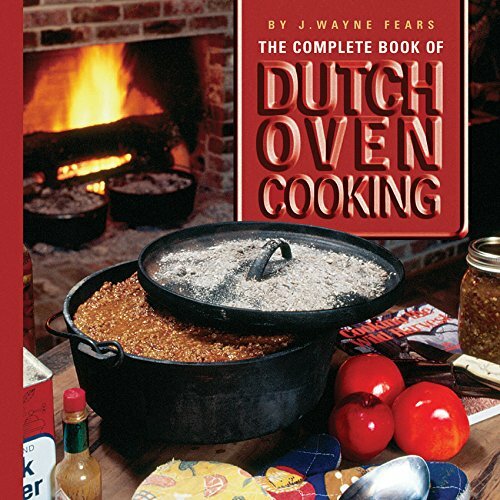 This classic offers dozens of great recipes, but even better are the tips and techniques for turning out delicious Dutch oven meals for two, ten, or fifty hungry campers. 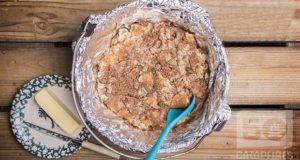 To prep and serve the contents of your Dutch ovens, you need the proper Dutch oven cooking tools. This set is a serviceable, inexpensive way to have everything you need in one place. 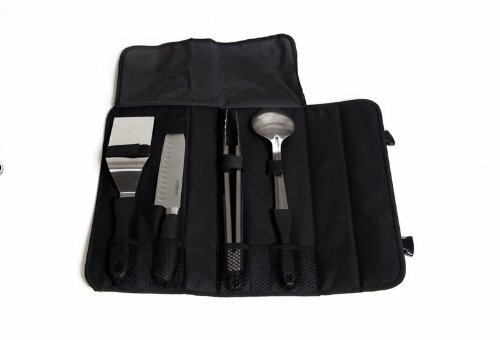 It includes 7-inch spatula with beveled edges for cutting and easy flipping, 7-inch hardened stainless santoku knife, heavy duty tongs, and flat-nosed spoon with long handle. If you have a big crew to cook for, you need a big Dutch oven. This is it. It will hold 12 quarts to serve 16-20 people. It’s also heavy. 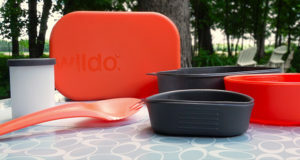 With lid – without food – it weighs 33 pounds. It leaves no doubt why chuck wagon cooks had the big guns. 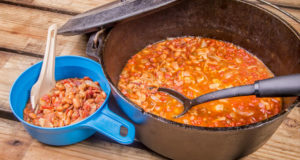 But when you turn out gallons of stew or chili for the hungry crew, you to will be a camp cooking hero. 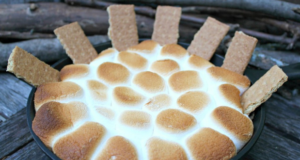 Ready to fill up your Dutch oven with something delicious? You’re in luck! We have 35 amazing Dutch oven recipes for you to choose from.